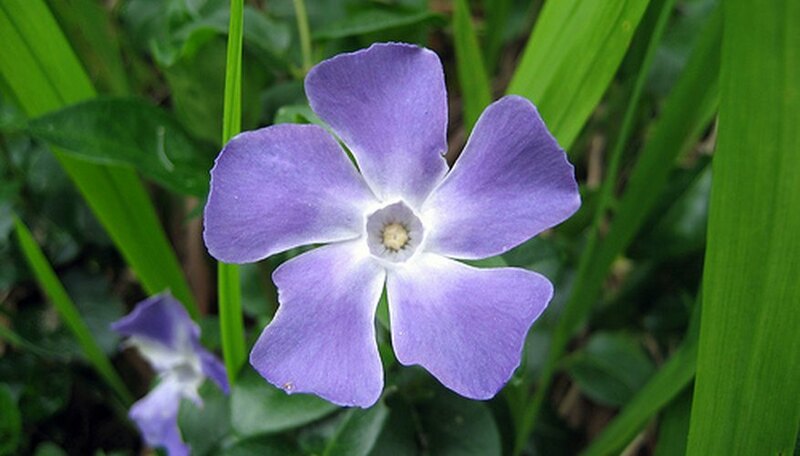 Vinca flowers, also known as periwinkle, are perennial flowering plants that thrive in shade and are tolerant of a wide range of soil conditions. They produce small violet, white or pink flowers in midspring through midfall and can also be grown successfully in containers. Vinca flowers are typically used as a ground cover in the garden, as they are low growing and spread rapidly once established. Vinca is easy to grow in most locations, with minimal care and maintenance. Dig a planting hole slightly wider than the roots and place the vinca plant inside with the top inch of the root ball slightly above the soil's surface. Space plants at least 1 foot apart. Plant vinca flowers in spring in an area that receives partial to full shade and has well-drained, average soil. Water vinca flowers thoroughly after planting and continue to water once per week during the summer months. Reduce watering to once every two weeks in the spring and fall. Keep the soil evenly moist during the first two growing seasons, after which vinca flowers will become tolerant of light drought conditions. Apply a 1- to 2-inch layer of bark mulch over the soil surrounding vincas after planting. Loamy topsoil may be used instead, if necessary. Mulching conserves moisture, which is important for vinca flowers to develop strong, established root systems. Replenish the mulch anytime it begins to visibly deteriorate. Feed vinca flowers once every two years using a slow-release, balanced fertilizer. Apply the fertilizer in spring just after new growth has begun for the best results. Refer to the instructions on the packaging for proper dosage and application. Water thoroughly before and after application if dry fertilizers are used. Use pruning shears to snip back stems that become overgrown, but trim vinca flowers only if they begin to grow out of bounds. Trimming is not necessary if you have unlimited growing space, but control may be needed in small garden beds. Vinca flowers may be grown indoors in containers. The plant requires full sun and consistently moist soil to thrive. Outdoor vincas may also be brought indoors during winter and replanted outside the following spring. Do not plant vinca flowers near azaleas or newly planted trees, to avoid fierce competition for water.